After purchasing my ithlete to monitor heart rate variability (HRV) well over a year ago I was unsure of whether to take measurements laying down (supine) or standing up. I don’t recall what it was exactly that prompted my decision, but I decided to measure standing. Since day one I’ve recorded my HRV in the exact same position (standing) after waking up for consistency. I often wonder however if this is the best way of measuring HRV for the purpose of monitoring training load and recovery status. Please understand that this article is simply my perspective on the topic based on my experience and research into the matter. Furthermore, I’ve yet to see this discussed in too much depth and therefore decided to investigate the issue myself. To present and discuss some data I collected over a two week period comparing my morning supine resting heart rate (RHR) and HRV score vs. my morning standing RHR and HRV score. Sympathetic impulses increase heart rate by exciting the SA node while parasympathetic impulses reduce heart rate by inhibiting it. Thus, with parasympathetic predominance we can expect heart rate to be less frequent and less consistent (more variability between beats) while sympathetic predominance would result in more beats with less variability. During supine rest, heart rate and blood pressure are lower as the body is in a relaxed state. From supine (a state of high parasympathetic activity and low sympathetic activity) to standing, there is a shift in sympathovagal balance characterised by a withdrawal of parasympathetic activity and a concomitant increase in sympathetic activity (Montano et al. 1994, Mourot et al. 2004). Naturally, the body needs to accommodate for postural change forcing the heart to beat harder and faster to pump blood to the brain; a task much less strenuous in the horizontal position. Mourout et al (2004) saw decreased HRV in overtrained athletes compared to not overtrained athletes in the supine position. Similar results were found when HRV was measured after 60 degree tilt. The non-OT group always had higher HRV in the standing position and saw greater reactivity to the postural change. Uusitalo et al (1999) saw similar results to the work mentioned above by Mourot. Overtrained athletes saw an increase in LF power in the supine position; lower HRV in the standing position; and decreased reactivity to postural change. Additionally, changes in maximal aerobic power were related to decreased HRV in the standing position. Grant et al. (2009) found that standing HRV indicators showed significantly more correlations with cardiopulmonary fitness indicators compared to supine measurements. The authors did however urge practitioners to use caution when attempting to measure fitness via HRV. Hedelin et al. (2001) found that during a 70 degree head up tilt, LF power correlated to measures of strength and aerobic capacity. A greater shift toward LF power in the tilted position correlated to reduced performance. Changes in LF were linearly related to changes in performance suggesting a reflection of adaptation to training. I will add that there is plenty of research that has demonstrated a detection of overtraining in athletes from measuring HRV in the supine position. The focus of this article however is on standing measurements. I summarize my thoughts and conclusions on the research at the end of this article. sRPE is my rating of perceived exertion of my workout from that day. Workouts rated as 8 or above were higher in volume and intensity while workouts rated as 7 were lower volume and intensity. A score of 5 or below represent active recovery work. Therefore it is the following day that will reflect quality of recovery. Keep in mind that workouts rated as 5 or above were resistance training based while workouts rated below 5 were more aerobic in nature to facilitate recovery. I have highlighted four instances that showed conflicting scores. On all four occasions supine HRV is high while standing HRV is low. Each of these conflicting scores occurred on days following a higher intensity workout. Based on my trends and perception of stress I find that the standing scores to be a more accurate reflection of my training load. Generally after an intense workout I’m sore the next morning and fatigued from the workout.When reviewing my overall trends (not just these two weeks) usually HR goes up and HRV decreases in response to a high loading day (sRPE 8+). Likewise, HR will decrease and HRV will increase in response to a lower loading day. However, I’ve found this to be subject to change based on sleep quality and other lifestyle factors that can promote a change in HRV. Non-training related stressors are not documented. This is a huge limitation as various forms of stress (mental, physical, chemical) can affect HRV. First and foremost, consistent measurements are more important than position. This is because each position appears to provide important data regarding training status. Therefore, pick a position and stick to it 100% of the time for your values to be meaningful. Switching positions from day to day will provide skewed data and affect daily ithlete colour indications. In my opinion, endurance athletes and individuals with low resting heart rates are probably better off measuring HRV in a standing position to avoid the potential affect of “parasympathetic saturation”. A colleague pointed out an important point after I ran this experiment; a standing HRV measurement will produce a larger sample size of R-R intervals which decreases margin for error. Nearly every paper I’ve read on HRV stresses that HRV varies a great deal between individuals. This means that you should not be comparing your data to others. In a team setting, it is important to always compare daily values to baseline (of each individual) for meaningful interpretations. A score of 80 may be high for one individual and low for another. I like the standing test for the simple reason that it provokes a small stress response. This removes the issues of parasympathetic saturation from the supine position. Seeing how your body responds to standing appears to give you a good idea of how your body can/will handle stress that day. If HRV remains high after standing (given time to stabilize) then you are likely in an adaptive state. If HRV is low after standing (given time to stabilize) you are likely less adaptive (currently under higher stress). HRV test length may influence positional preference. The ithlete measurement is a 1 minute test and therefore I don’t find the standing position to be a nuisance. However, I did prefer the supine measurements simply because I only needed to focus on breathing and nothing else. When measuring HRV with devices of longer duration I preferred the supine or seated position. Ultimately, you should experiment for yourself to determine positional measurement preference. Try recording data in both positions, compare it to perceived stress (training, mental, chemical, etc) and determine what method you like best. Hedelin, R. et al. (2001) Heart Rate Variability in athletes: relationship with central and peripheral performance. Medicine & Science in Sports & Exercise, 33(8), 1394-1398. Mourot, L. et al (2004) Decrease in heart rate variability with overtraining: assessment by the Poincare plot analysis. Clinical Physiology & Functional Imaging, 24(1):10-18. Andrew Flatt currently resides in Toronto, Ontario, Canada. He holds a Master’s Degree in Exercise Science with an interest pertaining to HRV and its application to monitoring training status in athletes. 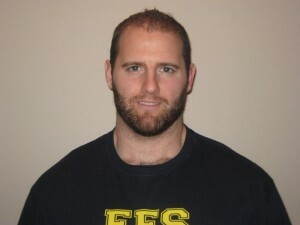 Andrew is a competitive powerlifter and former collegiate football player. Great write up thanks! I really like your not comparing scores. Is there any data that shows an athlete actually performs better over time if their HRV improves over time? Off the top of my head I can’t recall anything that specifically looked at long term HRV changes with performance, but that doesn’t mean it doesn’t exist. Rather, how one performs or adapts to training based on HRV score has been studied. Kiviniemi et al (2010) compared HRV guided aerobic training vs Pre-planned aerobic training. The results showed that men in the HRV group had greater maximum velocity than the pre planned group consistent with Kiviniemi et al (2007) results. The HRV female group saw no significant increase in maximum velocity over the pre planned group however the HRV female group was able to improve their fitness to the same levels of the pre planned group with a lower weekly training load (fewer high intensity training days). Cipryan et al (2007) showed that male hockey players have higher rated performances from their coach when HRV is high while any drops in HRV correspond with a lower rating of performance. Of the sample players, the one with consistently low HRV was rated the lowest in performance. In my experience HRV baseline will improve to a certain point in response to improved fitness. This improved fitness will obviously result in improved performance in most sports. However after this point it appears to be more about daily HRV changes and manipulating training accordingly. Strategically increasing loads when HRV scores are high and reducing loads when HRV is low. I may have digressed a little here. I hope that somewhat helped. Maybe I can help a little here. Martin Buchheit and his research team did a study on runners training for a 10km race in 2009.
observed between changes in vagal-related indices and changes in MAS and 10 km running time. Exercise HR decreased progressively during the training period (P 0.5% (responders), resting vagal-related indices showed a progressively increasing trend (time effect P = 0.03) and qualitative indications of possibly and likely higher values during week 7 [?7% (90% CI -3.7;17.0)] and week 9 [?10% (90% CI -1.5;23)] compared with pre-training values, respectively. So in summary, what they found was that in every case where the training program produced improved running speed in the 10km, their HRV (LnRMSSD) also increased. They also found some runners who did not improve their performance (non-responders) showed no significant improvement in HRV. Great stuff guys! It makes sense to me. A person who trains to HRV optimizes their training plan and hence can race faster that without. So what would a low reading be for a person? When I started HRV collection quite a few months ago my base line was like 65 now it’s looking like it’s going to be in the low 80s. Would it take a dip back down to the 60’s to say slow down or rest day or any significant drop off of base line which I suspect would show up as an orange or red ball? Next, now that I recently turned 55 (I never actually thought this would actually happen to me) is there any data regarding HRV and heart disease? I know I’m good to go in that department but I’m a geek and so curious. What about HRV and longevity? There is indeed lots of interesting research on HRV and heart disease – in fact one of the first clinical uses of HRV was to screen heart attack victims in ER to evaluate their prognosis – the lower their HRV, the poorer the chances they would make it through the next few days. HRV and longevity is a subject I find fascinating and rather than try to cover it here will do a blog post in the near future. Simon, I took up triathlon 2 years ago, 12 months ago I retired and became (by default) a fulltime triathlete. This August I completed my first Ironman at age 67. I’ve just started using ithlete, having stumbled over HRV when I was looking for a tool that would help me know when I was sufficiently recovered to train. I’m looking forward to reading your blog post on HRV and longevity. Congrats on your first IM Winston! I think monitoring your recovery with ithlete will help you train more effectively. Please do use the subjective sliders & record comments for the all-important context that will allow you to associate lifestyle with recovery. Hey Steve, interesting stuff. Ive used the iThlete for two month now and in supine position my hrv only varies +-5 max, so maybe in my case it would be more reliable standing? I have one further question though, what if you have a positive tilt test indicating orthostatic intolerance, can i still use the hrv from standing? my hr will be high even on a good day, but even higher on a bad day. Hi Andrew, great article and thanks for the quoted studies. What’s your take on the use of orthostatic HR change I.e HR supine to HR standing versus HRV standing as usable measures? Is there any reason to use one and not the other ? I haven’t collected enough data using the supine to standing method with calculated change scores (i.e., Rusko Test) to have a strong opinion. I think that the extra time to acquire both positional measurements would limit its practical implementation due to the added time. You will see that all the interesting variation with training state happens in the standing position, and together with research by Kiviniemi and others on parasympathetic saturation, convinced me that standing was probably going to the best single position for day to day HRV monitoring. I haven’t changed my mind since, but suspect that it is the torso being upright which is important, so sitting is probably a very good second best in people with all but the lowest resting HR values. Hello, how to delete old reading taking in Supine position? how soon after getting out of bed do you take the standing measurement? We recommend taking the reading right after waking. Have a moment to wake properly, use the bathroom if needed, then take the ithlete measurement. it is certainly important to do so before eating or drinking. Andrew Tamplin Android Andy Dolphin biochemistry blood analysis Bluetooth smart Brian Schwind coaching cycling Endurance sports Finger Sensor Georgina Gardner Stockley Health healthy living Heart rate monitor How to use HRV in sports training HRV Research InsideTracker Interval training ithlete ECG receiver ithlete HRV scores ithlete Pro ithlete Research John O'Regan Marathon nutrition Olympic overtraining Performance Precision Pulse product releases Recovery Running Simon Wegerif Sleep Sports science taper Team Sports Training Training load Triathlon TRIMP Ultra Running Wellness Why ithlete? © 2009-2017 HRV Fit Ltd. ithlete is a trademark of HRV Fit Ltd. All rights reserved.